Over the last fortnight, eight new polls have been published: two by Insa, two by Forsa, and one apiece by Dimap, Emnid, GMS, and FGW. For GMS, it is only the second poll conducted since the beginning of this year (a third one was published early in January, with fieldwork partly carried out in late December). 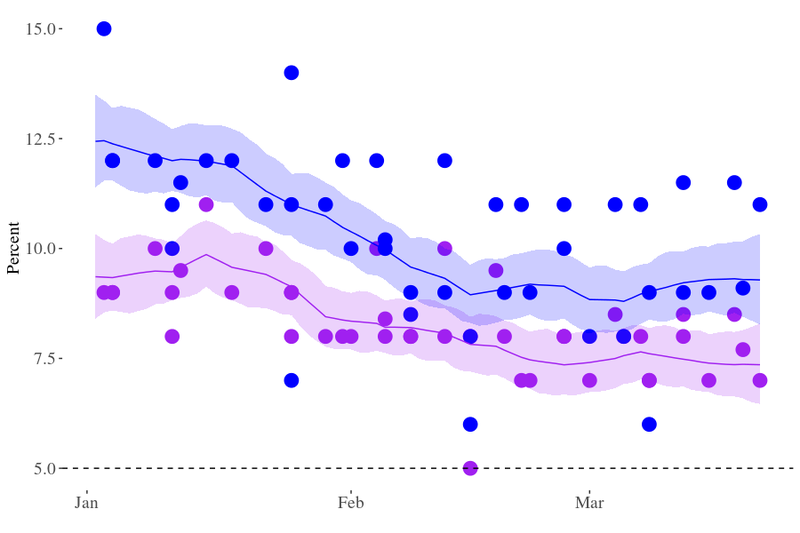 As usual, there is quite a bit of variation in the data (hence the pooling), although there is no such shocker as the (unweighted) FGW poll done in mid-February which put the SPD at 42 per cent, twice of what they had been polling in early January. The SPD and the Christian Democrats are in a dead heat, but …? Probably no “but” so far. Back in late January, the SPD’s fortunes began to rise rapidly thanks to their new candidate Martin Schulz (aka St Martin), and by early February, support for the two major parties had become statistically indistinguishable. For the last ten days or so, the model has put the CDU about a percentage point ahead of the SPD, but that does not mean a thing: the credible intervals are still more or less identical. 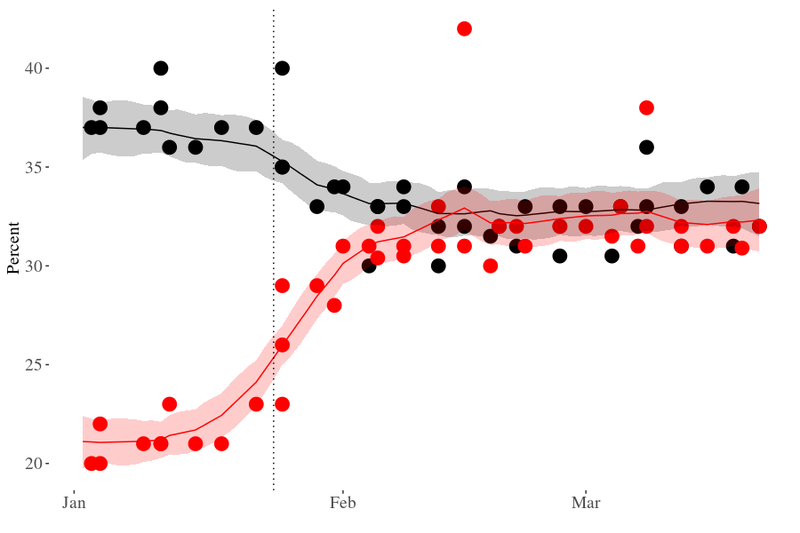 The SPD’s rise and rise in the polls has stopped in March, but the Schulz effect is still very much a thing. Since January, the AfD has lost a bit of steam (i.e. about 2 points) in the polls, but it is still the strongest opposition party at just under 10 per cent. The model-based line in the graph suggests that over the last couple of weeks, the party has recovered a wee bit, but that movement is negligible (have a look at the scale), just a teensy-weensy wiggle well within a wide credible band. Similarly, the Left is basically where it was two (and four, and six) weeks ago at 7.5 per cent. The Greens had a bad start into the campaign. Just when they had selected two Spitzenkandidaten from the more conservative wing of the party (signalling that they might enter a CDU/CSU/Green coalition), the SPD pulled a Schulz on them by choosing a leader who would attract leftist voters and would at least ponder the prospects of an SPD/Left/Green coalition. 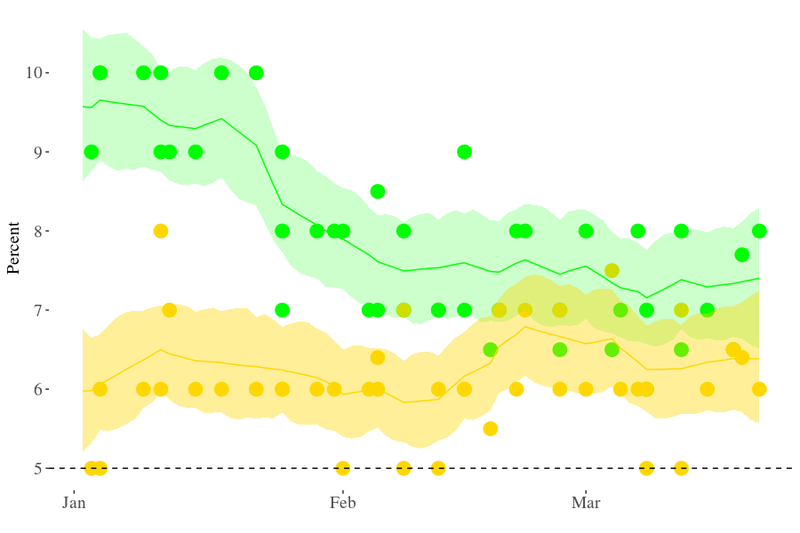 The Greens lost a couple of points in January and early February but have been perfectly stable since. Conversely, the FDP may or may not have won a point since February. Like with the AfD, the wiggling is not impressive, given the width of the credible intervals. But importantly, this interval has not touched the electoral threshold of five per cent during the last three months, though the threshold is never that far away. The polls are noisy as ever, but the model, which tries to account for house effects and random errors, suggests that the noise is just that, and that so far there was no real movement in political support in March. This picture is at least plausible: Apart from the AfD, all parties have selected their respective Spitzenkandidaten by now, it’s still six months to go, and there have been no major domestic events. 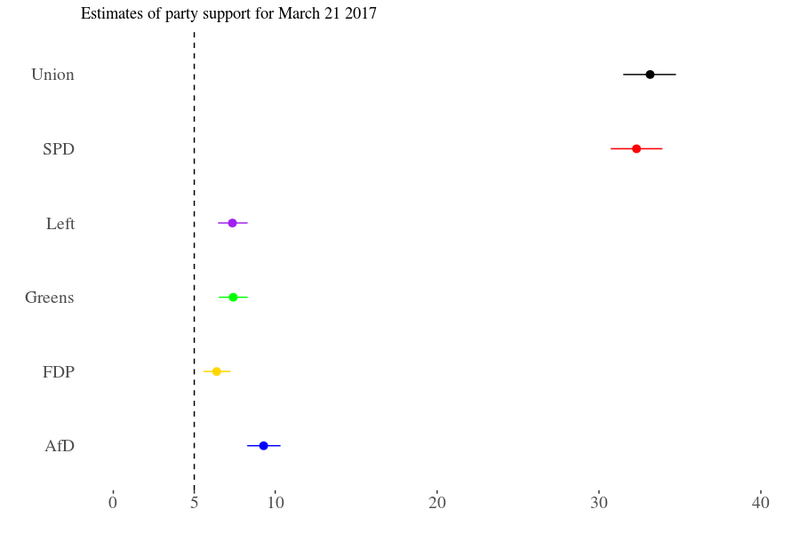 At current levels of support, the Bundestag would have two (relatively) major parties that could continue the Grand coalition, although it’s not quite clear which one would hold the chancellorship, and four almost identically-sized minor parties, commanding between six and ten per cent of the vote. In such a relatively fragmented parliament, the chances (in a purely statistical sense) for forming a SPD/Left/Green coalition are slim: Only in 15 per cent of all draws from the (simulated) joint distribution of support is there a sufficient red-red-green majority. At 12 per cent, the chances of a numerical majority for a “Jamaica” coalition (Christian Democrats, FDP, Greens) are even lower. In none of the the simulations is either a SPD/Greens or Christian Democrats/FDP coalition feasible. It would be Grand Coalition, or new elections, or minority cabinet rule (a first). But remember the mantra: It’s six months to go, we’re very much talking about political mood, not firm intentions here, and this is just a model that tries to average over many different noisy and potentially biased polls.